Dudjom Tenzin Yeshe Dorje (b. 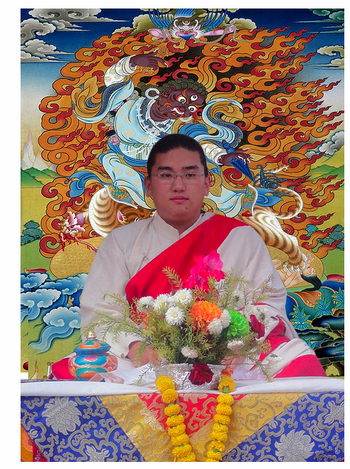 1990) is a reincarnation of Dudjom Rinpoche and resides mainly in Bhutan and Nepal. Dudjom Tenzin Yeshe Dorje was born in 1990 as the first of two sons of a couple of Bhutanese students of Dudjom Rinpoche. His father, Kesang Dadul, is the son of Dasbo Drongong and a descendent of the Nyo lineage of Bumthang. His mother, Sonam Chokyi, is the daughter of Colonel Penjo Ongi and Choden. He was recognized as an incarnation of Dudjom Rinpoche by Dudjom Sangyum Rigdzin Wangmo, the second wife of Dudjom Rinpoche, by Shenphen Dawa Rinpoche (younger son of Dudjom Rinpoche), and by the Dalai Lama. On the 30th of September 1993, the enthronement ceremony was held in Dudjom Gompa, in Boudhanath, Nepal, by Trulshik Rinpoche at the behest of Dudjom Sangyum Rikdzin Wangmo. The ceremony of initiating Dudjom Tenzin Yeshe Dorje’s education was performed in July 1994, in Nagi Gompa, by Tulku Urgyen Rinpoche. Dudjom Tenzin Yeshe Dorje resides and studies mainly at two places: Dudjom Namdrol Choling, across the valley from Yangleshö cave in Pharping, Khatmandu ; and in Sartsham Chorten, opposite Taktsang Monastery, Paro, Bhutan, where he has founded a gomde, or study and practice center for lay practitioners. Dudjom Tenzin Yeshe Dorje also oversees the activities of the Nyimalung Monastery dratshangs in Bumthang and Gelephu, Bhutan. In 2005, he was appointed as the monastery's first abbot. In the last few years, Dudjom Tenzin Yeshe Dorje has performed many drubchens and conferred empowerments at various monasteries in Bhutan and India, and has presided annually at the Ngagyur Nyingma Chenmo world peace prayers at Bodhgaya, India. This page was last edited on 9 January 2016, at 02:37.